There is so much value to marketing your brand with custom reusable bags. From the eco merits, to the return on your investment, and the increase in brand awareness and recognition, your business has a lot to gain from marketing with custom reusable bags. Customize away and create something that speaks for your business and serves as a reminder to your customers when they grab your branded bag and head out to the store. There are a number of factors that make disposable plastic bags bad for the environment. They are made from non-renewable resources, so once these resources are used that’s it – we don’t have any more. Once single-use plastic bags have fulfilled their usefulness, they are difficult to recycle, which is on the verge of being moot, since they seldom are recycled. By understanding the drawbacks of disposable plastic bags, it makes it so much easier to see the benefits of reusable grocery bags. Reusable bags can be made from a variety of eco-friendly materials, including sustainable options like jute, cotton, and bamboo to recycled selections, like non-woven polypropylene. The reusable nature of the bags means your customers will get years of use out of them, and eventually, when they wear out they can be recycled or composted with no ill effect on the environment. Reusable shopping bags eliminate the need and use of disposable bags, which is a win for the environment. Reusable bags offer prime real estate to showcase your branding message. When people carry a bag that features your branding message, they are essentially carrying a sign promoting your business. The lifespan of a reusable bag depends upon how often it is used, but a quality reusable shopping bag will typically last at least 6 years, so your investment will be paying off from a long time to come. Carrying a branded bag also works like an endorsement because when other people see their friends, relatives or coworkers carrying your branded bag, they will see that are a sign of support. 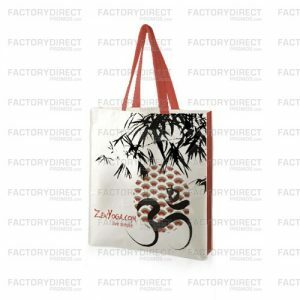 Branded reusable bags will get your marketing information in front of an audience it may be hard to reach otherwise. Reusable bags offer a highly visible way to spread your branding message. You can alter the look and design of your branded reusable bag, so it effectively and clearly gets your branding message out there, but also so if is convenient for your customers to use. Remember also that there are many different styles of reusable custom so you do not have to stick to a shopping bag. The more convenient the bag the more your customers will use it, and the more your customers use it the more exposure your brand receives. Add printing on the gusset or the inside, lengthen or shorten the handles, add a zipper or snaps or a handy pocket for a phone or keys. Anything you can do that builds style and function into the bag will make it useful for your customers, so it will become a favorite. A well-made promotional bag will certainly be something your customers will appreciate, and this will be a positive association and build a rapport between your brand and customers. From the financial value, eco benefits and increased visibility custom reusable bags have so much to offer. We can help you design a reusable custom bag that will increase your brand’s awareness either by introducing your brand to people or reinforcing your message. If you have questions or need a quote, get in touch HERE and we will get to work helping you create a custom reusable bag. Previous Previous post: How Many Plastic Bags are Used Each Year in the U.S.?